What is Data Logging, Data Loggers, and Monitoring? We talk with dozens of customers every week and we often find that they may be asking about Product A but really need Product B. To help identify the right product, it is useful to talk about data logging versus monitoring and about what a data logger does. If you don’t feel like reading about data logging and data loggers right now and would prefer to talk with one of our applications specialists about what product is right for your project, give us a call at 1-800-956-4437, strike up a chat during our regular business hours, or send a message directly here! Regulatory requirements – To meet documentation requirements like those from the FDA. Customer requirements – To provide documentation to their customer that the items delivered were correctly manufactured or processed. Quality control and improvement – To ensure that what you are providing meets your own specifications or to provide data for a quality improvement process. Test documentation – This could be for evaluating a new device or process, reliability testing, end of line testing or basic research. Troubleshooting/Fault isolation – Something bad is happening and data is needed to figure out why. While data logging may or may not involve real-time display of the measurements, it always involves storing measurements in some form either for archiving or later analysis. For the majority of applications the recording is done at a regular interval like once a second or once a day, however there are occasions where the recording is triggered by some event for example to capture the pressure each time the operator presses a button. Also, data logging nearly always includes a timestamp as part of the record to identify when the data was measured. Another question you may ask yourself is what kind of data is logged? It turns out that our data loggers can record almost anything, normal things like temperature, pressure, voltage, flow rate and strange things like how much water did my toilet flush use or when was the last time that lab rat 32 went to the food dish? keyboard_arrow_rightHow is Monitoring Different than Data Logging? At the most basic level, monitoring like temperature monitoring of a cooler, is fundamentally different from data logging in that while the temperature is measured it is not recorded for use after the fact. Monitoring system sometimes have a display so that a person can see the current value and take immediate action if something is not right. Sometimes that are also provided with some alarm capability like a LED to indicate a threshold had been exceeded at some point or an alarm buzzer that sounds if a limit has been exceeded. While monitoring systems use similar measurement hardware to data loggers, the lack of memory for time stamped historical readings makes the hardware simpler and less expensive. keyboard_arrow_rightWhat is a data logger? Based on the previous 2 sections, let’s talk more about what makes up a data logger. Universal input data loggers that allow configuration of each input channel for specific type of signal. 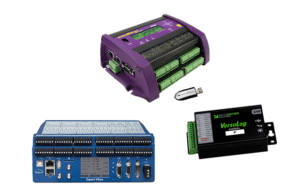 Universal loggers are often supplied with a mix of inputs; analog inputs for measurement of voltage or current, digital inputs for reading the state of switch or relay and communications input for reading serial sensor or Modbus data. How often it samples the input? How many inputs it is recording? How often is the data downloaded? Removable memory device – SD card, USB stick, etc. Learn more about data loggers. keyboard_arrow_rightWhere are data loggers used? Data loggers are used in all kinds of industries and for all kinds of applications. For example, agriculture and horticulture, temperature monitoring in storage and transportation of food; environmental monitoring both internal and external; laboratories and healthcare; automotive industry, energy measurement, quality assurance, research and more. keyboard_arrow_rightHow are data loggers powered? Most data loggers operate on batteries, but some models can also be powered externally. Usually data loggers consume very low power. You’ll want to note the battery life which varies considerably based on the manufacturer, model and how often it’s designed to take readings (sample rate). Many data loggers have non-volatile memory which ensures that recorded data is still safe if the battery fails or power is lost. The logger’s software will usually tell you when the battery’s getting low. You can also choose a model with a user-replaceable battery. keyboard_arrow_rightHow accurate are data loggers? This depends on the model, but many data loggers are more than accurate enough to cover most applications. If you’re monitoring product or room temperature, a logger that’s accurate within a few degrees should be enough, which will keep the price low, but some applications benefit more from high-accuracy models accurate within one-tenths of a degree. keyboard_arrow_rightHow many data loggers do I need? This depends on the number of monitoring points you have, for instance how many areas you need to cover in a given room or on a product pallet. Data loggers are available in configurations with anywhere from one to hundreds of inputs. keyboard_arrow_rightHow long can data loggers record? Many data logger models are durable and will continue to reliably operate for at least a few years, although cold chain data loggers are available which do the job for a single trip and a low cost. Modern loggers can take a sample every second which is more than enough for most cold chain applications. Sample rate is inversely tied to battery life and the max sample rate depends on the logger chosen. Recording duration depends on the memory capacity of the logger and the sample rate. Duration can be determined by dividing the memory capacity by the sample rate. For example if the logger can store 10,000 samples and you take 2 samples every minute, the logger could run for 10,000/2 or 5,000 minutes (about 3 days). keyboard_arrow_rightWhere are alarms usually sent? Local alarms can consist of anything from bright LED indicators and beeps to loggers with external alarm outputs. More sophisticated models will automatically send you an email or text alarm to your smartphone so you’re always on top of potentially critical changes in your product or process. keyboard_arrow_rightHow do you retreive the data? Many data loggers record data to a memory card or Flash stick for easy retrieval. More advanced models can also send the data automatically over Serial, Ethernet, or wireless communication (WiFi dataloggers, etc.). Users often make selections based on their facility’s wired or wireless setup. keyboard_arrow_rightDo you have to learn how to program? For the average user the answer is no! Data loggers commonly use Windows-based control software for setup and configuration. Simply connect the logger to a PC, follow the configuration wizard and pick your sampling rate and start time—all this normally just takes a few mouse clicks. If you need a data logger for documentation purposes, it’s especially important to find software that can print out graphs and tables to show auditors proof of your best practices. keyboard_arrow_rightHow much do data loggers usually cost? When shopping for a data logger, you want to be sure that the device itself can do everything you need, including the right # of inputs to cover all your points, communication options and software. While most loggers are quite affordable, check to see if that includes everything–avoid paying extra for memory cards, communication modules or software. keyboard_arrow_rightWhere can I buy a data logger? You’ll find lots of data logger manufacturers and distributors online, so make sure you buy from a supplier offering free technical support. While data loggers are easy to use, you won’t get stuck if there’s a number you can call if you run into a problem, especially if you’re a first-time user.